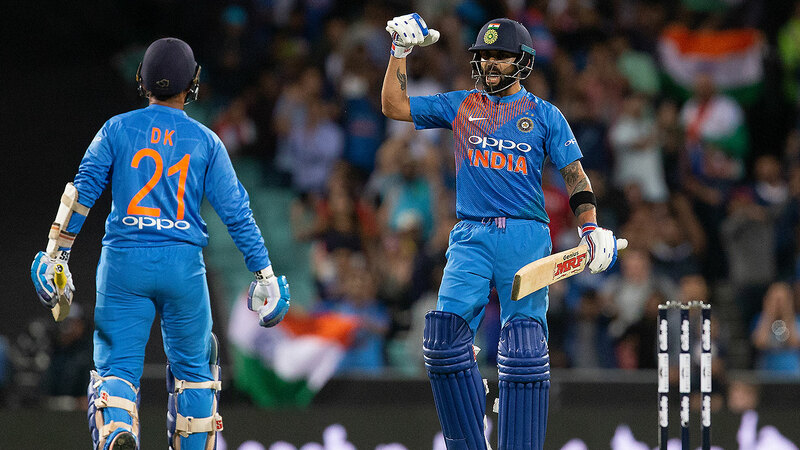 Australia suffered another spin-induced collapse then Virat Kohli outclassed them with the bat in Sunday's Twenty20 series finale at the SCG, where India hauled in a target of 165. Kohli top-scored with an unbeaten 61 to deliver his side a six-wicket win with two balls remaining, ensuring the three-game series finished drawn 1-1. The topsy-turvy tussle was played in front of a sell-out crowd of 37,339, a venue record for a T20 international. As was the case in Brisbane and Melbourne, India's supporters comfortably outnumbered Australia's fans. They were at their loudest when Kohli rattled off the winnings runs with a boundary. The captain cracked AJ Tye's delivery over mid-wicket to emphatically end the match and his match-changing innings, which came a week and a half before the four-Test series starts in Adelaide. In one sense, Australia did well to post 6-164 as they chased a maiden T20 series win over India. No side had ever produced such a big T20 score without hitting at least one six. But Australia's inability to clear the rope and Kohli's composed response, coupled with a collapse of 3-5 that followed a promising 68-run opening stand from Aaron Finch and D'Arcy Short, ultimately led to their downfall. India shot out of the blocks in their run-chase, cantering to 0-67 in the sixth over. Recalled spearhead Mitchell Starc broke a boundary-laden opening partnership between Rohit Sharma and Shikhar Dhawan then legspinner Adam Zampa's wicket maiden gave Australia a sniff. KL Rahul and Rishabh Pant went cheaply as India slipped to 4-108 but Kohli steadied in superb style. "He's an unbelievable chaser," Glenn Maxwell said on Fox Cricket. Finch and Short, having struggled to put together an opening partnership of substance in Australia's past seven T20s, both fired after the former won the toss. Finch (28) and Short (33) both fell sweeping in quick succession. The sweep shot, combined with the guile of left-arm spinner Krunal Pandya, also led to a golden duck for Ben McDermott as Australia lost 3-5. The collapse would have been even worse if not for Maxwell's successful review of his lbw dismissal on four. Marcus Stoinis and Nathan Coulter-Nile pushed the total beyond 160 with a couple of late boundaries but couldn't swing momentum after Pandya's game-changing haul of 4-36. Stoinis and Chris Lynn, two of Australia's cleanest strikers, were demoted to No.6 and No.7 respectively in a reshuffled order. Finch was given a life on 22 but failed to make the most of it. Finch, set to open when the first Test starts on December 6, has now scored 124 runs from his past 11 innings for Australia.